Welcome to Art Class! 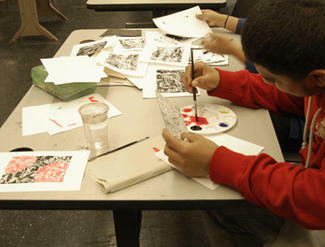 Art Production is an introduction to visual and fine arts practices. Students will develop various artistic skills as they learn to problem solve the California Visual Arts Standards of: Artistic Perception, Creative Expression, Historical/ Cultural Context, Aesthetics, and the Connections to other disciplines. In our class students will be taught to express themselves creatively using different media including drawing, printmaking, painting, and sculpture. Student Conduct: Students will show up on time to class with a positive attitude, follow all class rules, and be ready to contribute to class projects. Create original works of art to communicate an idea. Explore a variety of visual arts media and techniques. Demonstrate an understanding of how to solve visual art problems. Integrate what is learned in Art Production into other academic subject matter. Learn skills that translate into practical experience in the job world. Learn the value of time management when creating art. Learn to use and identify the elements of art and design in artwork. Make informed judgments when critiquing our own work as well as others. Discuss artwork using artistic academic vocabulary. Click HERE to download class syllabus.